Would you buy a Pepsi smartphone? You are here: GeekSays Technology News » Android » Would you buy a Pepsi smartphone? We don’t know if the guys from the marketing department wanted to make fun of us, but yeah, it seems that a Pepsi smartphone will be available soon. Coke fans, you can stop reading now. 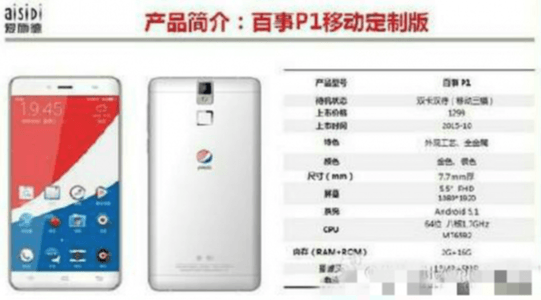 According to Phandroid, the company confirmed that this will be just a China-only device and it will be marketed as Pepsi P1. Yeah right, like anybody would call it like that instead of ‘Pepsi smartphone’. But wait, it’s not that bad! But believe it or not, the phone seems to be a pretty nice deal, offering a more than decent spec sheet at a pocket friendly price. It comes with a 5.5″ display, sporting a full HD resolution of 1920 x 1080 pixels, while under the hood it has a quad-core processor, running at 1.7 GHz, alongside 2 GB of RAM and 16 GB of internal storage. In terms of cameras, the Pepsi smartphone has a 13 MP sensor on the back, while the 5 MP front-facing camera is great for a quick selfie. The fingerprint scanner isn’t missing either, while the 3000 mAh battery should provide enough juice for a full day of intensive use. Finally, the handset, which also sports a fully metallic, 7,62 mm thin, body, will be powered by Android 5.1 Lollipop. Could this be a threat for devices coming from well known manufacturers? As for the price, the same source mentions that the phone will be available just for $200. Overall, the specs look good, but it’s hard to reach a verdict, since we don’t know anything about the build quality. But hey, it’s a metallic phone, it should be at least decent. This isn’t the first time a company that’s not related to the smartphone industry in any way launched such a device and it definitely won’t be the last time it happens. If the Pepsi smartphone will be a real hit or just dust in the wind, we will see in a few months. Any first impressions about this device?